[SatNews] Sir Martin Sweeting, SSTL’s Chairman, looks forward to the year ahead and expresses his thoughts in the latest Surrey Satellite Technology Ltd. (SSTL) online blog. 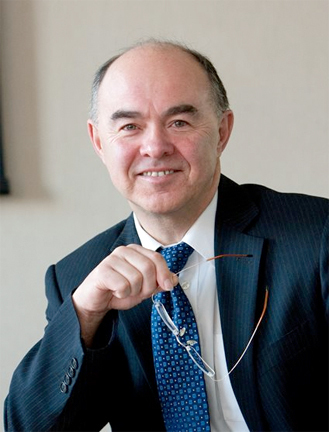 Sir Martin Sweeting, Chairman, SSTL. "From small beginnings in 1985, SSTL has been at the forefront of the smallsats revolution by relentlessly examining the far horizons of space technology for new opportunities to innovate and to disrupt the ‘status quo’. We enjoy the challenges of going further into space, and packing more advanced space capabilities into smaller and lighter spacecraft, and we have ambitious plans for 2015, our 30th year in operation. "Firstly, we are aiming to deliver our new X-series platforms to customers, space-ready in just 6 months, to keep new technologies fresh for our customer’s missions. To achieve this, we have developed new X-series scalable avionics using card-frame technology and we have introduced batch-build manufacturing and test processes in our clean rooms. The first set of new generation avionics and platform design are already in production for KazSTSAT, which will be our first X-series satellite, built in the UK in collaboration with Kazakh engineers from Ghalam LLP. 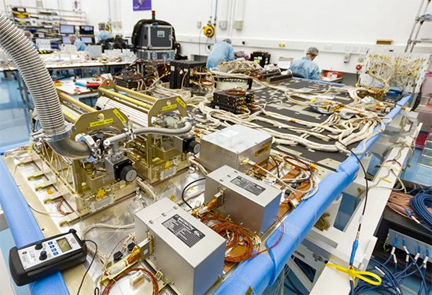 NovaSAR platform during assembly and integration in November of 2014. 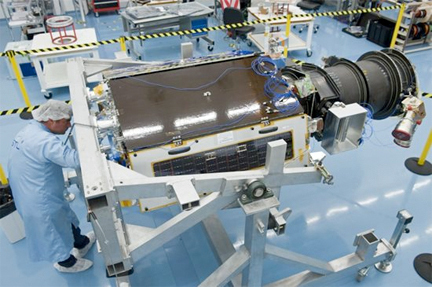 "We also have our first Synthetic Aperture Radar (SAR) satellite, NovaSAR, taking shape in our clean rooms. NovaSAR is a medium-resolution, low-cost, radar mission using an SSTL platform with an S-Band imaging payload developed by Airbus Defence and Space, and an AIS payload supplied by ComDev. It’s an innovative new spacecraft, and stands at 3m tall. In preparation for vibration qualification testing, the accelerometers have just been fitted, and also flight solar array panels with mass dummies representing each of the critical items of avionics and payloads. Manufacturing of NovaSAR will continue through 2015, in readiness for launch in 2016. We’re not standing still with our radar capabilities though, and we’re already developing our next generation SAR, with potential X-Band options. "At the end of last year, we were able to share the fantastic news that SSTL’s first small geostationary communications spacecraft will be manufactured for Eutelsat’s new Quantum telecoms mission. 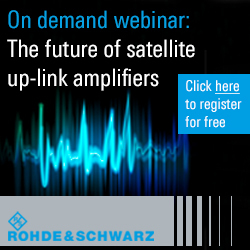 We have already completed work on the Eutelsat Quantum design, verification plan and schedules, and we expect to sign contracts soon. Shortly thereafter we’ll begin manufacture, but in fact we’ve been working on our small Geo design, the SSTL GMP-T platform, for some years now, under ARTES funding from ESA. Just recently the GMP-T Structural Qualification Model left Guildford for transportation to Airbus Toulouse, where it will undergo sine vibration qualification testing. 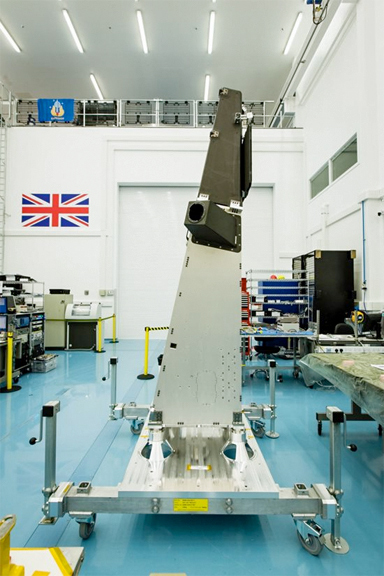 SSTL GMP-T platform structural qualification model central thrust tube in August of 2014. Photo is courtesy of SSTL. 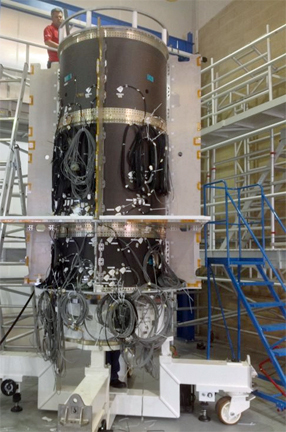 One of the DMC3 spacecraft during assembly and integration phase in November of 2014. "We are due to launch the DMC3 constellation spacecraft from Sriharikota in India during May 2015—the exact launch date is still to be confirmed. The three SSTL-300S1 spacecraft will provide 1 meter very high resolution imagery with a high speed downlink and 45 degree off-pointing agility. The three satellites will form a new constellation, DMC3, with daily revisit times crucial for change detection, disaster monitoring, and acquiring cloud-free imagery. The spacecraft design features advanced avionics and optical systems that make it possible to perform several different types of imaging, such as mapping terrain, strip imaging, and mosaic imaging making this a highly-versatile earth observation mission for our customer, Beijing-based mapping company, 21AT. We’re very much looking forward to sharing news from the launch site and seeing the first 1 meter imagery from the new constellation—it will be important milestone for us, and another achievement for small satellites. Galileo navigation payload during assembly and test at SSTL. "In August last year, I attended the launch of the first of SSTL’s navigation payloads on-board Galileo 5 and 6 FOC satellites from Kourou, French Guiana. Unfortunately space can be a risky business and the satellites were injected into the wrong orbit, but the good news is that the the two satellites have subsequently been proved to be operational and with some position correction, they can still form part of the operational constellation. We anticipate more Galileo spacecraft launches this year, but meanwhile, we are continuing to produce the 22 navigation payloads for the Galileo FOC constellation, and have now delivered 12 sets to our partner in Germany, OHB, where they are being integrated to the platform, before being sent for testing at ESA’s ESTEC facility. "Looking back as we start the New Year, 2014 was one of our most active years ever and our manufacturing pipeline is going to remain busy into 2015. Plus subsystems and avionics suites for various customers. "Of course it goes without saying that innovation rules at SSTL and we’re working on some exciting new concepts, some of them in collaboration with our research colleagues at the Surrey Space Centre – we have a close synergy, and while we’re weighing up possibilities on the far horizons, they are often ahead of the game with some new cool tech that we can put to good use in the here and now. I can’t share these imaginative new ideas with you yet, but you’ll see news from us as the year goes on. You’ll no doubt see us out and about all over the globe this year—in 2014, we attended more than 50 events and exhibitions and we’ll be getting ourselves out there again to talk about what we do, how we do it, and what we’d like to do next. You can find out where we’ll be by checking out the Conferences page on the website which we regularly update.